There is a lot more to the Isthmus of Panama besides the fact that it connects the continents of North America and South America. In this Vacayholics post, we shall shed some light on the various facts about the Isthmus of Panama that you might have never come across before. If you wind back by 20 million years, which is not a long time in terms of geological history, you will realize that the place where the Isthmus of Panama exists today was a part of the ocean. Before they built the Panama Canal, ships sailing from New York to California (or the other way round) had to go around the Cape Horn at the southern tip of South America―a 7,800-mile journey―as the Isthmus of Panama separated the Atlantic Ocean from the Pacific Ocean. That's not to deride the Isthmus of Panama. On the contrary, it has several interesting facts associated with it. For instance, it was this landform that facilitated the Great American Interchange, wherein, animals from North America migrated to South America, and vice versa. The history of this isthmus is quite fascinating, be it from a geological perspective or a political perspective. In geography, an isthmus is a narrow strip of land which divides a body of water (or separates two bodies of water) and connects two large landmasses. While there is no dearth of examples of isthmuses in the world, the Isthmus of Panama, which connects North America and South America, is hands-down the most famous one around. The Isthmus of Panama can be identified by its characteristic 'S' shape. Besides connecting the two Americas, the Isthmus of Panama also separates the Caribbean Sea from the Gulf of Panama in the Pacific Ocean. The S-shaped landform begins at the border of Costa Rica, and runs from east to west for about 400 miles to the border of Colombia. ✦ Geological evidence suggests that the Isthmus of Panama was formed during the late Pliocene Period, as a result of volcanic activity triggered by plate tectonics ... the collision of the Pacific and Caribbean Plates, to be precise. It closed the Central American Seaway separating the Americas, which had formed when the super-continent Pangea separated during the Mesozoic Era. ✦ The newly formed land bridge didn't just connect two previously separated continents, but also separated two previously connected water bodies, the Atlantic and Pacific, and disrupted the flow of water between them. This, in turn, rerouted ocean currents leading to the formation of the Gulf Stream, altered the salinity of water, and even changed the climate of the region. ✦ The formation of this isthmus in Central America also facilitated the Great American Interchange around 3 million years ago, wherein, species from North America used this land bridge to migrate to South America, and species from the South used it to migrate northward. The ancestors of species like porcupines and armadillos came to North America via this isthmus. ✦ In 1513, renowned Spanish explorer Vasco Nunez de Balboa became the first European to reach the eastern coast of North America, when he crossed the Isthmus of Panama―then known as the Isthmus of Darien. Before Balboa, his compatriot Rodrigo de Bastidas had visited the area in 1501, and thus, is credited with the discovery of the Central American nation. ✦ In 1534, after Balboa's trip revealed that the Isthmus of Panama was very narrow, the then Roman emperor Charles V ordered a survey to assess the feasibility of constructing an artificial waterway across it. After detailed inspection of the area, surveyors came to the conclusion that there was no scope to construct any such waterway. ✦ It was its strategic location that prompted many countries to try to gain its control. Even the Kingdom of Scotland attempted to establish its colony on the isthmus, and gain from the overland route connecting the Atlantic Ocean with the Pacific, in what was known as the Darien Scheme. ✦ During the California Gold Rush, people came to California from various parts of the world. Some of them sailed to the Atlantic side of the Isthmus of Panama, trekked across it all the way to the Pacific side, and took a ship heading to San Francisco. Between 1848 and 1869, a total of 600,000 individuals crossed the isthmus in their bid to seek the precious metal. 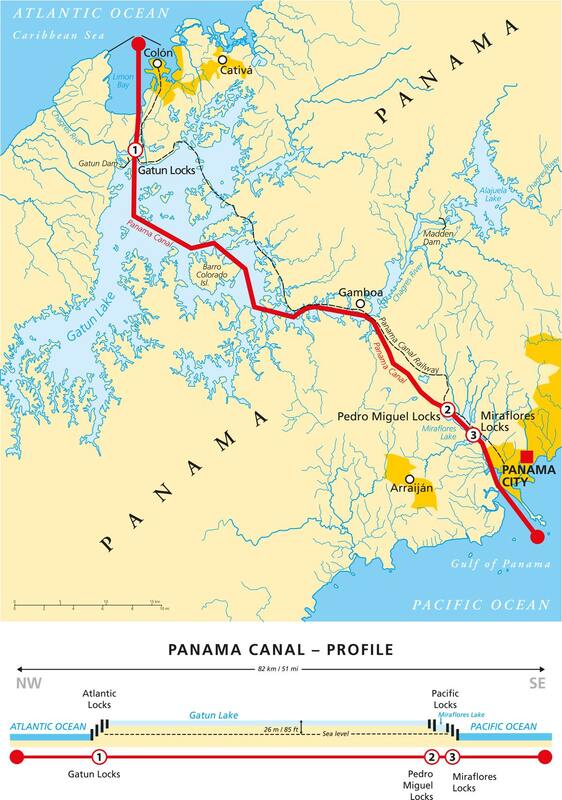 A map of Panama profiling the Panama Canal. ✦ In 1881, a French company headed by Ferdinand de Lesseps, who had previously built the Suez Canal, began working on a canal through the Isthmus of Panama. The concept of building a canal at sea level turned out to be much more difficult than they had imagined. The incomplete project cost the company US$287,000,000, eventually resulting in its bankruptcy, and cost over 20,000 workers their lives, primarily due to tropical diseases. ✦ On May 4, 1904, the United States took control of the Panama Canal construction that the French had left incomplete, in lieu of US$40 million. It took them 10 years, and US$375 million, including the US$40 million that they paid the French, and US$10 million that they paid to Panama, to complete the construction of the Panama Canal. The operation of this canal began on August 15, 1914; 34 years after the French began its construction. A ship passing through the Panama Canal. ✦ On September 7, 1977, the United States and Panama signed the Torrijos-Carter Treaties. According to these treaties, the Carter administration agreed to handover the control of canal operations and its defense to Panama, but reserved the right to defend the canal in the event of any threat that could affect its neutrality. 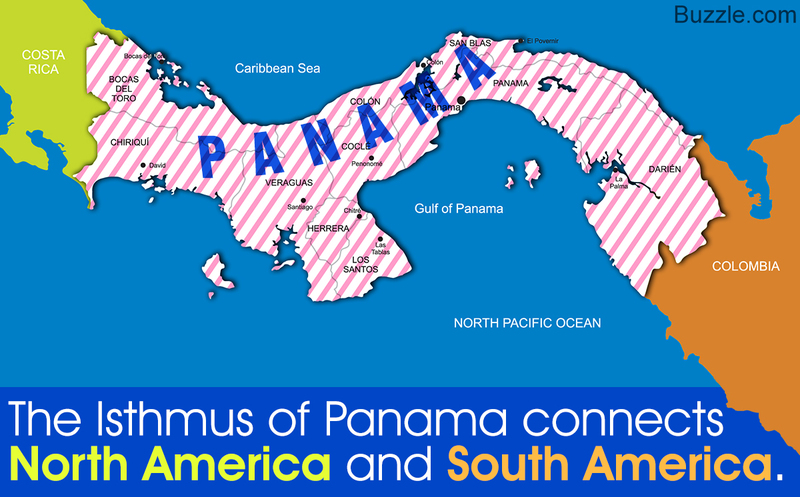 As you can see from these Isthmus of Panama facts, this landform has played a crucial role in shaping the world. However, there does exist one lesser-known fact about the Panama Canal. We know that the United States was successful in building a canal across the Panama Isthmus, but this isthmus was not their first choice. The Americans were contemplating the idea of building a canal across Nicaragua, but changed their mind after it was brought to their notice that the said zone was prone to volcanic activity. 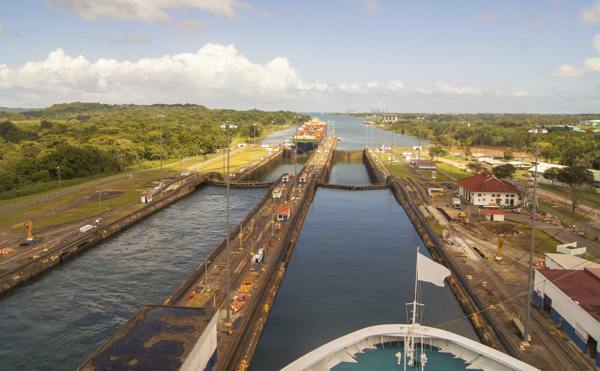 Post Script: On December 22, 2014, the HKND (Hong Kong Nicaragua Canal Development) Group began working on the Nicaragua Grand Canal, connecting the Caribbean Sea with the Pacific Ocean, which is scheduled to be completed by 2020.